PREORDER TOP SHELF’S JULY RELEASES IN THE CURRENT DIAMOND PREVIEWS! The new May Diamond Previews catalog has THREE great titles available for pre-ordering: Top Shelf’s first foray into the world of alternative Manga with AX (VOL 1), the debut volume of James Kochalka’s new all-ages series DRAGON PUNCHER, and Renee French’s THE TICKING, finally coming back in print! 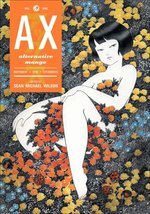 Ax is the premier Japanese magazine for alternative comics. Published bi-monthly for over ten years now, the pages of Ax contain the most creative and cutting-edge works of independent comics from the world’s largest comics industry. Now Top Shelf presents a 400-page collection of stories from ten years of Ax history, translated into English for the first time! This groundbreaking book includes work by 33 artists, including Yoshihiro Tatsumi (A Drifting Life), Imiri Sakabashira (The Box Man), Kazuichi Hanawa (Doing Time), Akino Kondoh, Shin’ichi Abe, and many many more! I was starting to worry that this might wind up on my “most anticipated titles” list for three years in a row. This entry was posted on Wednesday, April 28th, 2010 at 10:30 am and is filed under Anthologies, Press releases, Top Shelf. You can follow any responses to this entry through the RSS 2.0 feed. Both comments and pings are currently closed.